"The Walking Dead" Season 2, Episode 11: He’s a threat! Or maybe he's a trap. 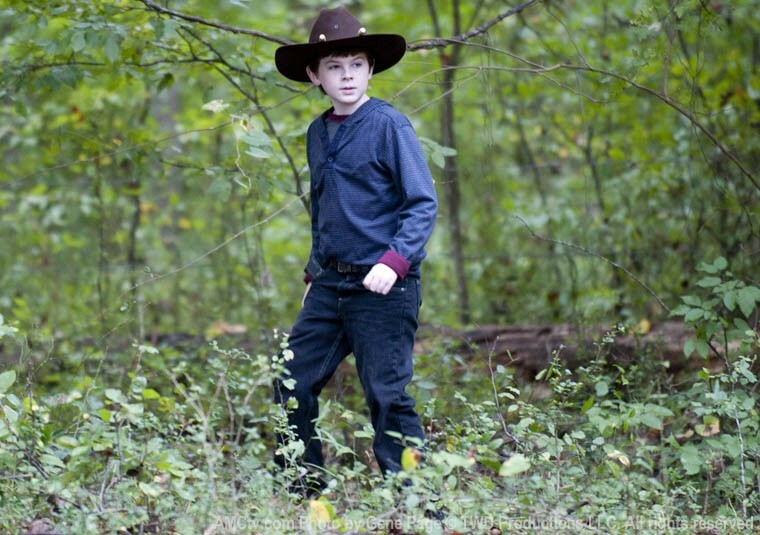 Carl (Chandler Riggs) first and foremost, was an interesting case. A kid growing up with all this around him is bound to be a little on the fringes so to speak, but we haven’t seen a lot of him lately and all of a sudden now he was all gung ho and snippy. Hormones perhaps? I really really really wanted to see him shoot something, be it a walker, or the prisoner, and the repeated suspense building with no resolution got old fast. Though, I’m not sure when Carl’s balls dropped, but he had some great moments, particularly with his father and with Carol(Melissa McBride).I’m starting to think his role is only going to grow as he does. And Dale (Jeffrey DeMunn).Poor, poor Dale. I’ll admit this episode alone made my mind do summersaults over him. I used to be a huge Dale fan; the staunch old grizzly bearded man with a heart of gold. I’ve felt that ship sinking of late, and his moral crusade this episode started to wear me down. With Rick (Andrew Lincoln) and Shane (Jon Bernthal) back, Randall (Michael Zegen) in toe, Dale started a politician touring circuit, trying to change everybody in the group’s mind about killing him. Dale did have some good points; but I wish he didn’t make the argument so unlikable. He may be the remaining moral voice in the group (“Please, let’s just do what’s right”), but I just couldn’t figure out why he was taking this so personally and making such a stand on it. The more and more he went on though, the more I liked what he was saying and felt bad for him. He wasn’t arguing to save the man’s life, but for his own ever-fading view of the world. He stormed off when the group decided they had no other choice but to kill Randall in fear he would lead his group to the farm, and Dale left a teary eyes and broken man. In hindsight of what happened, that all hit a little closer to home. On the whole Randall situation: I don’t know if I would or could have pulled the trigger or not. But that’s what makes the show so interesting to begin with. The morality is so far removed from how any of us can relate. Rick ends up pussing out at the execution when Carl walks in and tells him he should do it. Carl, again, moving and shaking the world. With only a few minutes left I was utterly disappointed. Carl’s story seemed dead in the water, and Rick has yet again been unable to do what he felt he had to. But, it’s the end that made it all worthwhile. And that brings us to Dale. Again, poor, poor Dale. Ambushed by the same walker that Carl has been early unable to kill. Ultimately, it wasn’t Rick(who can’t seem to fire a friggin’ gun) but Daryl (Norman Reedus) who pulled the trigger to put Dale out of hismisery. After going back and forth on how I felt about him, it was still a kick to the chest to see his entrails ripped out and him lying there. It reminded me that I did care about Dale after a whole episode had me going back and forth. His death did overshadow the Randall situation, and it just came out of nowhere. But that’s probably what made it work so well. We aren’t in Kansas anymore, that’s for sure.